1.Position 2 oven racks to upper and lower positions; preheat oven to 350°. Line 2 rimmed baking pans with aluminum foil. 2.In medium microwave-safe bowl, with fork, mix butter, mustard, poppy seeds and Worcestershire until well combined. Using about two-thirds butter mixture, spread on cut sides of each roll. Divide bottom halves of rolls between two prepared pans; over butter mixture on bottom halves, evenly divide and fold ham slices. 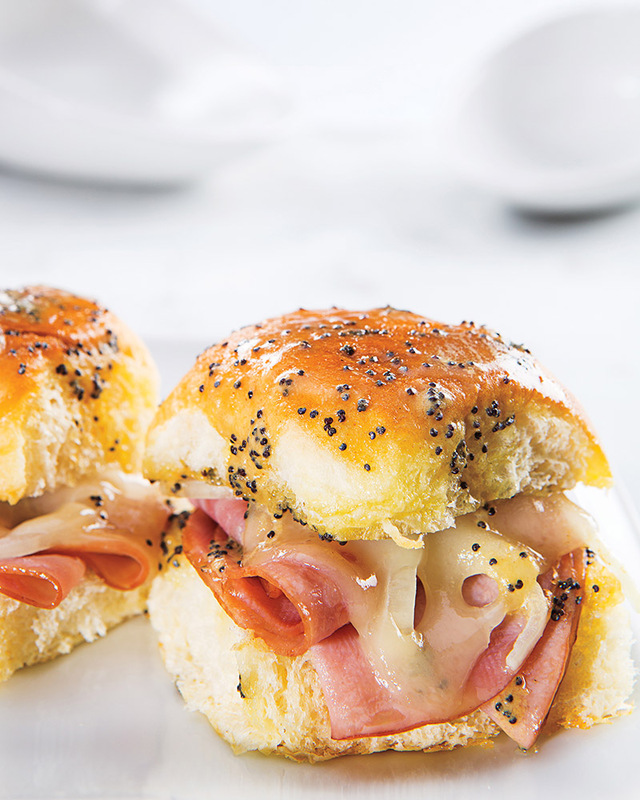 Evenly top ham with onion and 1 piece cheese; close sliders. 3.Heat remaining one-third butter mixture in microwave oven on high 20 to 30 seconds or just until melted. Evenly brush melted butter mixture over tops of sliders. Cover pans with foil; let stand 10 minutes. 4.Bake sliders 13 minutes or until cheese melts; uncover and bake 2 minutes longer or until tops of sliders are lightly browned. > For a lower sodium deli ham, try our Healthy Ones brand from your local Martin’s deli, certified by the American Heart Association.